this post contains affiliate links for products that I truly believe in. There's nothing like the fresh beauty of a brand new baby – until the sleep deprivation hits - and then there's nothing like a three-hour chunk of sleep! The newborn stage can be legit insanity. I myself had several nights where I was so sleep deprived, I had nightmares that people were going to take my newborn baby away because I was going crazy! Even when I woke up, my husband had a hard time convincing me it wasn't true- I was practically delirious. And it wasn't any easier with the second, since not only was she also a "bad sleeper", but I also had a 1.5 year old to run after all day long. 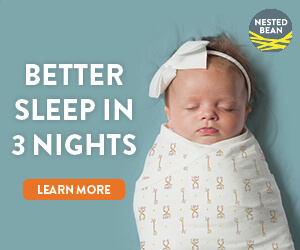 I know you think your baby hates it because she fights it and squirms and gets out of it, but trust me when I say that 99.5% of all newborn babies will settle more easily and sleep longer with a good swaddle. Make sure to do it when they are calm, not already fussy, and make it nice and tight around their arms so that they can't get out (but not too tight around the chest that it restricts their breathing- obviously- and not around the hips). Timing and technique really do make the difference! Keep trying to find the swaddle that works for you. (I absolutely love this weighted one from Nested Bean. Use this link to get free shipping in the USA.) Once they are swaddled well, then add the other soothing techniques you know, like rocking, shushing, bouncing, etc. A wake time is the time between when a baby wakes up and when they need to go back to sleep again. This time is very short in the newborn stage – only a maximum of 60 minutes in the first month and working its way up to 80 minutes by the end of the second month. You can add about 5 minutes to their wake-time each week and stay on track. Most parents miss this window and babe gets overtired, meaning he/she will have stress hormones raging through his/her body, making it very difficult to get them back to sleep again. Be vigilant about not keeping babe up too long, and start your nap routine/settling to sleep 15 minutes BEFORE the end of the awake time. 3. Focus on Full Feeds. 4. Make Dad King Soother. My real-life husband was the KING of bouncing and soothing our first love. With my newborn clients, I focus on teaching moms AND dads my best soothing techniques so that dad can feel confident and capable. It often goes even better when dad is involved, especially with breastfed babies, because can't smell mom's milk. If only all newborns slept like this all the time! Hang in there, Mamma! You're doing an amazing thing keeping this tiny human alive 24-7. Give yourself lots of grace, and don't be afraid to contact us for help! Click here to book your free consultation.